John Conyers, Chair of the House Judiciary Committee, wrote a book in 2006 calling for impeachment, but is now dragging his feet about starting hearings, even though six members of the Committee demand immediate hearings and 30 members of Congress want hearings to start. The Impeachment Slate is asking Monica Conyers, his wife, to join over 100 impeachment candidates nationwide and to run against her husband for Congress. "Politicians are not meant to hold office forever. When a politician comes upon a job too challenging to face, he or she should step aside in favor of someone who is not afraid to act." Each candidate spoke briefly, complementing one another's committment and view that Impeachment is the Constitutional remedy most urgently needed at this moment in time. 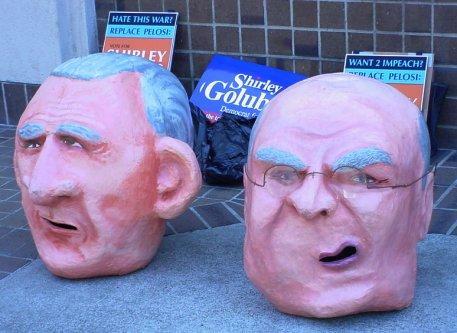 Shirley Golub produced the play "I", The Impeachment Trial of George W. Bush and Richard B. Cheney which premiered May 17th and will run through this weekend (May 30th & 31st). The play is excellent, but sadly shows that Congress has aided and abetted the Bush/Cheney regime all this time, can hardly convict them without convicting themselves, unless there was a reverberating, enormous general outcry, and pressure placed on Congress, and the media. The media was conspicuously absent from the Press Conference, with the exception of the activist media, who also took photos, filmed, applauded, held signs, passed out literature. 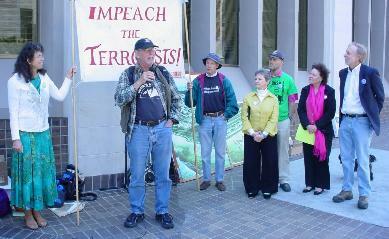 The "eye candy" included a large "Impeach the Terrorists!" 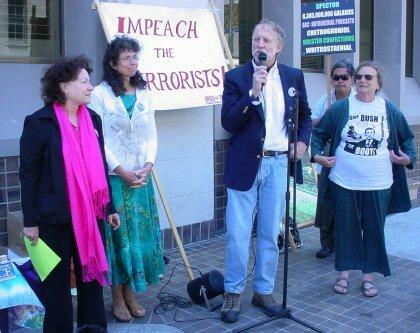 banner, two giant heads of the current President and Vice President, giant photos of the early Beach Impeach's that Brad Newsham organized where a thousand people spelled it out very clearly for Pelosi what was demanded of her by her constituency and the country. I remembered when we rallied and demanded "Preemptive Impeachment of Bush" back in January 2003, before he could launch a war on Iraq. I didn't have time to write a speech, but mentioned that that morning I received an email from a woman whose husband had been on my radio show the night before. He was a structural engineer and part of Architects and Engineers for 9/11 Truth. Although she understood the science and problems with the official story of the buildings collapse, she felt the major problem was "denial." In the wake of the traumatic events of September 11th, even some of the engineers experienced cognitive dissonance, unable to process the visual evidence they witnessed with explanations that defied their basic understanding of physical reality. I tried to gently remind people that the war on terror was a fraud, that the 9/11 Report was a lie, based on tortured evidence. I had brought with me, my favorite sign, shaped like a key, with Impeach and a Justice symbol on one side, and 9/11 Truth and the Peace symbol on the other side. "We cannot allow the Democrats to do the "War on Terror" better than the Republicans. We need a real investigation." Carol Wolman was particularly eloquent about the need for impeachment and mentioned the New Broom Coalition and the Longhouse Coalition, both national coalitions, dedicated towards impeachment, and gaining new members. "The need for impeachment is my original motivation in running for Congress. As a parent and a senior, I worry about the future. I am watching the economy, the environment, the public sector, the quality of life deteriorate rapidly since Bush took office. Meanwhile, the US government, Bush and Cheney with the collusion of Congress, spends billions of our tax dollars daily on illegal, immoral attacks on other countries. Mike Thompson, by refusing to vote for impeachment and by consistently voting for military spending bills, is part of the problem. "As a psychiatrist, I am watching the country being hypnotized by madmen who believe that they, and some of us, can survive a nuclear war. By threatening to nuke Iran, they have turned Iran's military allies, Russia and China, against us. Bush and Cheney have openly threatened us with World War III. This is insane and suicidal. "As a patriotic American, I am watching in horror as our precious freedoms and civil liberties are trampled. Mike Thompson has done nothing to repeal or amend the Patriot Act, the Homeland Security Act, the Military Commissions Act, which render any opponents of Bush and Cheney vulnerable to being labeled "enemy combatants" and to being "disappeared", without even the protection of habeas corpus. The legislation for fascism is all in place, and Mike Thompson has allowed it to happen. "We need a clean sweep of Congress." We need couragous citizens to step up to the plate and replace corrupt, corporate/military serving politicians. I encourage everyone to support write-in or authentic Impeachment, 9/11 Truth, Peace candidates in your Congressional District or to consider running for office, if no one else is championing Truth, Peace, Impeachment. One, two, even a dozen honest, courageous souls in Congress isn't enough, we need a tidal shift. I hope that all 9/11 Truth/Impeachment Congressional candidates will join our coalitions and raise our issues in every Congressional candidate forum. olduser_01 on Wed, 05/28/2008 - 6:06pm.